Awesome Views!!! Watch the sail boats & seagulls. Two pools. Two hot tubs. About our Condo--Grand Pointe is a beachfront property!...From our unit you will breathe in the spectacular,panoramic views of three bodies of water, the Gulf of Mexico,Perdido Pass,Perdido Bay, and Ole River from our long covered porch accessed from the living room AND master bedroom...There is something for everyone in this large and airy upscale, modern, sunny,cheerful, condo with views of constant sailboat and yacht traffic. You can lie in bed with your coffee and delight in the water splendor! We especially like our view of the beachfront state park across the bridge--beautiful to see in its natural state--just dunes, sea oats, and the gulf--it looks islandish. The light hitting the water makes everything look turquoise. Our 4th floor unit, convenient elevator access, features granite countertops, 9 foot ceilings, crown molding, ceiling fans, wet bar, jacuzzi tub in Mbr and Mbr walk in closet to make this your beach home away from home! Decorated in pottery barn style beach and nautical theme you'll love our unit at Grand Pointe, a unique gulf front gated property situated on 8 sandy white BEACHFRONT private acres. Yes. There is a $129 cleaning fee. There is also an Alabama lodging tax of 11%. 2. How is the beach at Grand Pointe? 4. How are the pools? We have two an indoor and outdoor pool(s)and they are large and awesome! 5. The undercover parking area is reserved for owners with the remainder of the parking spaces within Grand Pointe's GATED AND SECURE parking lot. 6. Yes we have FREE wireless internet reception for your laptop! 7. Minimum 3 day rental...the above prices are firm. 8. Email me anytime...all emails checked and responded to asap...leave voice message anytime,with name,dates requested,phone number,questions. I will return your call asap & Thank-you for your consideration in renting our condo! 9. Will I have fun on my little styrofoam boogie board? Yes! When the surf is up you will have lots of fun catching the waves and riding to shore--so much fun you won't want to come in! silverware, and dishes. Wet bar, full size washer and dryer, iron and board, and vacuum. The indoor heated pool area has huge glass windows that allow you to view the Perdido Pass channel/waterway to the Gulf and also the HUGE outdoor pool with large tanning area. 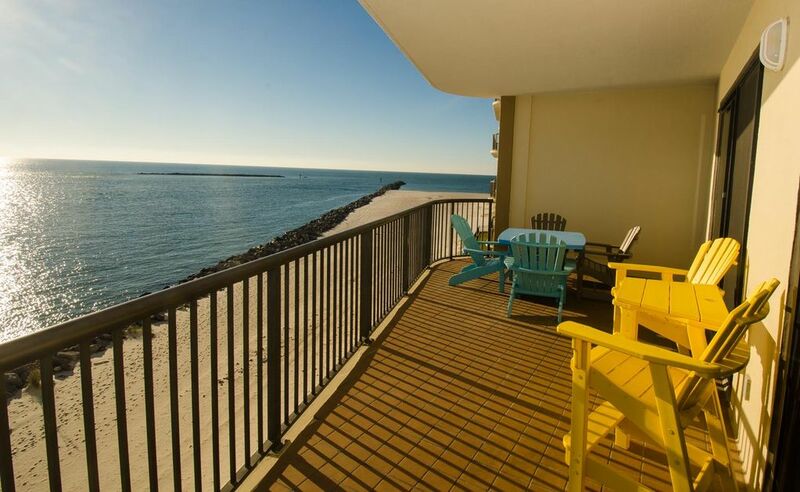 Keywords: Grand Pointe is a beachfront property!-Yes, you are on the beach!...walk down our boardwalk to the beach! Bring your own beach chair or reserve umbrella/teak beach loungers on beach! We absolutely loved this condo. It was clean, has enough room for our family answers the views were amazing! Definitely one of the best beach trips we have had as a family. Will definitely be back. We've stayed at Grand Pointe on several occasions. This unit was very nice & is perhaps my favorite of ones we've stayed in. Clean; updated appliances; room to spread out. MBR could use some sort of black out drapes or blinds as it gets very early morning sun. Also could have used a hair dryer in at least one of the bathrooms. We love the location of Grand Pointe. The beach seems less crowded as it's right at the end by the Pass. Loved watching the OBA "rush hour" each morning & evening as the boats departed & returned. Plenty of space and a very welcoming decor.